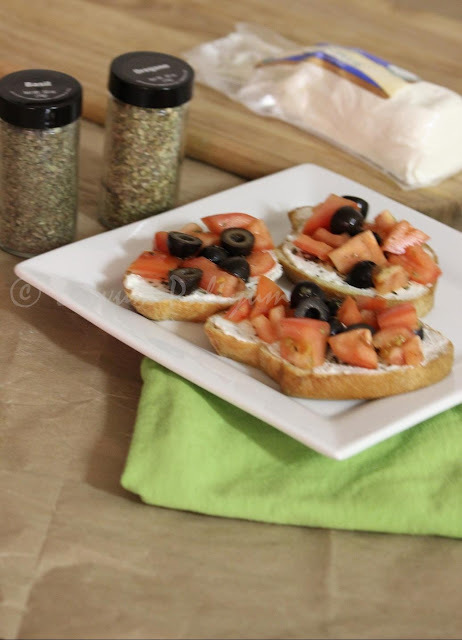 Italian bruschetta is a simple appetizer that can be served warm.It consists of grilled bread rubbed with garlic and olive oil.The variations can be many to the toppings which includes beans,tomatoes,cured meat or cheese.This can be served as a snack too.We can toast the bread slices in the oven and add the toppings.I have used goat cheese in this recipe,read about the health benefits of goat cheese in my previous post of goat cheese tartlettes.Try n Enjoy as a quick appetizer for parties or just as snack at home !!! Arrange the italian bread slices in a a tray and pour a gash of olive oil on them.Repeat the same by reversing the other side. In the meantime,leave the goat cheese on the counter top to come to room temperature.smooth it out spreadabale using a knife or spoon. Preheat oven to 300 degrees F and toast the bread for 7-8 minutes until lightly toasted.Increase time if you wish a charred bread. Allow the bread to cool and rub the garlic clove on all slices.Scoop a tsp of goat cheese and smooth it out on the bread slice. 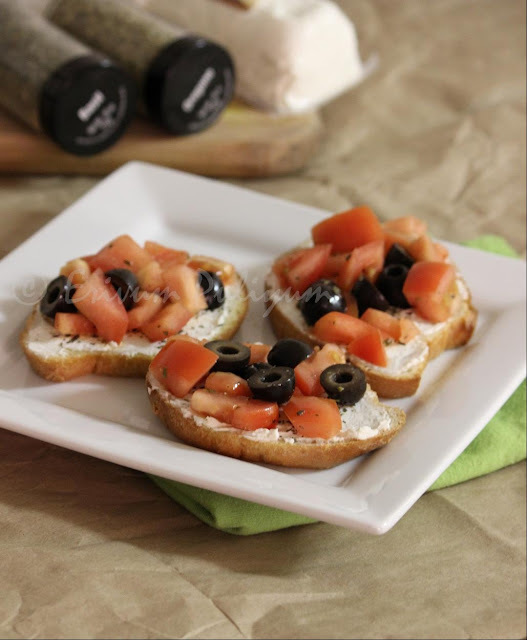 If you are using dried basil,then add on the top of the cheese.In the mean time,Add the chopped tomatoes,halved olives,pepper powder,salt,pinch of oregano and a tsp of olive oil.Scoop a tsp of mixture on the bread slices and Serve warm !! * If you are using fresh basil leaves,top it above the chopped tomato topping. * If you don't like the flavor of goat cheese,use mozarella cubes instead. * You can use french baguette too instead of Italian loaf.I have used Italian loaf in this recipe. * You can have different variations to this recipe using chick peas,cooked chicken instead of this mix. Wow, that is hi fi...!!! I love your simple, quick and honest bruschetta. 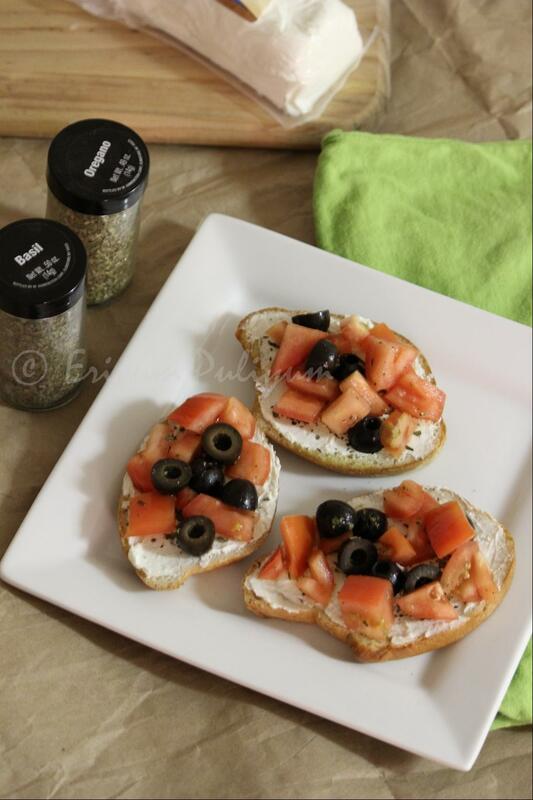 Bruschettas are always a dashing snack!! The first time I tasted, was in Little Italy restaurant in Bangalore and loved them! The toppings were corn, tomato, olives and capsicum with some cheese! nice cliks n its tempting..perfect 4 kids specially. Looks tempting and so healthy with the tomatoes. Delicious appetizer Julie...love the clicks..
Looks very delicious, my family really enjoys these! Nice clicks Julie, a healthy starter.. Goat cheese my favorite. I will give it a try!